Leah Hogsten | The Salt Lake Tribune Utah State Aggies head coach Matt Wells and Brigham Young Cougars head coach Kalani Sitake shake hands after the game. Utah State University defeated BYU, 45-20, at Lavell Edwards Stadium in Provo, Friday, Oct. 5, 2018. Provo • Handling prosperity and success well has not been a strength of the BYU football team in coach Kalani Sitake’s past two seasons. Saturday’s deflating 7-6 loss to Northern Illinois dropped BYU’s record to 1-6 in games following a victory, not counting last year’s season-ending win over Hawaii, which was followed by the season-opening win at Arizona with a revamped offensive coaching staff. That’s not good. And it is wildly inconsistent, which was the theme of Sitake’s weekly press briefing Monday as the Cougars (4-4) began preparations to take on 6-2 Boise State on Saturday at Albertsons Stadium (8:15 p.m. MDT, ESPN2). Assistant head coach Ed Lamb rightfully pointed out on his “Coordinators Corner” program Monday that a 1-6 record after wins is not a surprising statistic for a .500 team, which is what the Cougars are in the Sitake era. The loss to NIU dropped the coach’s overall record to 17-17. At least that’s consistent. Consistently mediocre. 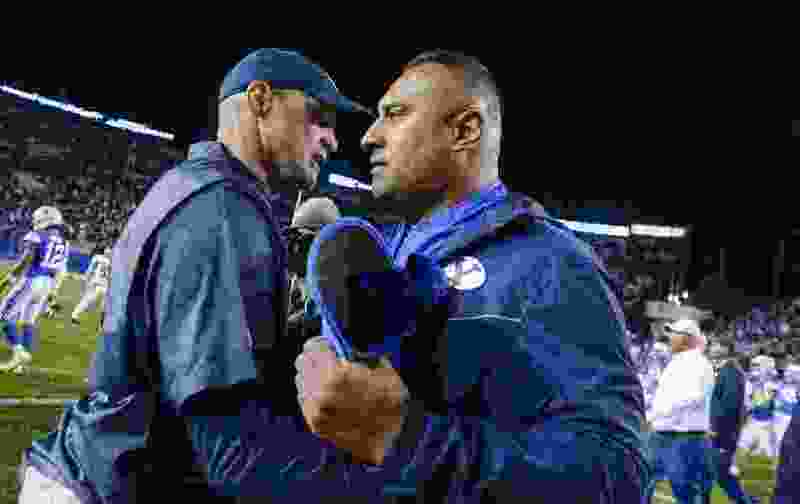 “Any criticism is justified and legitimate,” Lamb acknowledged, and Sitake shouldered the blame and took responsibility for another loss on Monday, just as he has done the past three years. Later in Monday’s 12-minute question-and-answer session in which he said the word “consistent” or a derivative thereof no fewer than 17 times, Sitake said the failure to post consecutive wins is his fault. He even joked that he should “bring a banner” to his weekly meeting with reporters saying as much. “And you guys can read it and that is going to be the answer to every question that you ask me,” he said. The only time BYU has followed a win with another within the same season the past two years was the 30-3 triumph over FCS foe McNeese after the 24-21 win over then-No. 6 Wisconsin. A win over the 6-2 Broncos, who are 4-0 all-time against BYU on the blue turf, would go a long way in winning back those fans, many of whom stayed away from LaVell Edwards Stadium on a perfect autumn afternoon. Announced attendance was 51,084, but the 63,725-seat stadium appeared only two-thirds to three-quarters full. Kaufusi, tight end Matt Bushman and receiver Micah Simon all said Monday that practices after wins are similar to practices after losses. Bushman said the Cougars don’t get overconfident or lackadaisical after wins, as some have suggested. And maybe, put together a modest winning streak. But with these guys, that would be inconsistent.